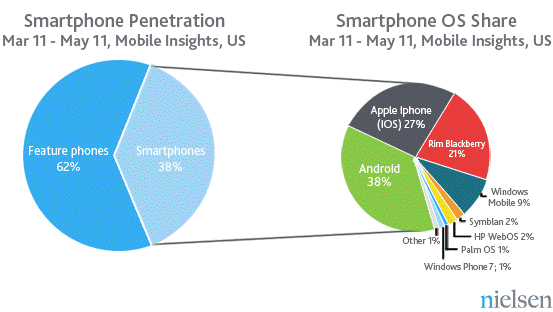 Smartphones are popular phones. According to Nielsen, 38% of Americans now own smartphones, and 55% of those who purchased a new handset in the past three months bought a smartphone (rather than a dumb one), up from 34% a year ago. Android’s growth curve flattened in 2011 while the iPhone’s got a boost. Collectively, Android and iOS are activating over 800k devices per day.